How do I access my avast account, and what can I do there? Question of the week: How do I access My avast! account, and what can I do there? The My avast! account was created so you can manage all your avast! software and services from one area. You can enter your account by clicking on the avast! icon in the system tray in the bottom right corner of your computer. This opens the avast! user interface. 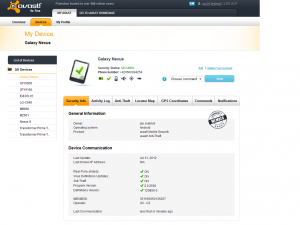 In the Summary section of the UI, you can see if the device you are using is connected to your My avast! account. To the right of that is a link to connect, http://my.avast.com. Click this link to log in and connect the device to your account. Once you are there, you can see all your avast! protected devices in one place. This is quite useful if you have multiple devices like a PC, tablet and mobile phone. The section called Security Info gives you a summary of protection for each device. If your avast! Antivirus license is expiring soon, it will remind you and give you the opportunity to renew. For those of you with Android phones, your My avast! account provides valuable information related to avast! Anti-Theft. You can change the settings, for example, add a friend’s number to communicate with your phone if it gets stolen, remotely wipe or lock the phone or stealthily send SMS commands. The Locator Map finds the position of the phone, so you can track it. Check out your My avast! account here, http://my.avast.com.